Seeing a spider in your house can be alarming, but is there really cause for concern? Most people are afraid of spiders. When an eight-legged visitor shows up near the bathtub drain or hiding behind the garage door, emotions can run high. While the average house spider is harmless, there are a few types of spiders that are dangerous. Knowing which spiders are dangerous, and which you don’t need to be afraid of can definitely come in handy. Being able to identify a spider you see in your home, and how to remove it, could help save you and your family from painful spider bites that could lead to illness. Black Widow: This spider can be found anywhere in the United States. Black widows most common in the Southern and Western regions of America. They prefer to live in undisturbed areas. Outdoors, they may be found among rock or woodpiles. Indoors, they are likely to occupy garages, storage sheds, or crawlspaces. Black widows can be identified by their round, shiny black bodies and the distinctive red hourglass marking on their underside. 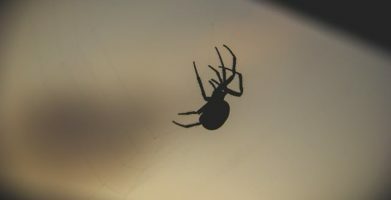 Black widow bites are rarely fatal, but can be serious and should receive medical attention as soon as possible. Symptoms may include headache, muscle cramps and weakness, difficulty breathing and a target shaped sore. 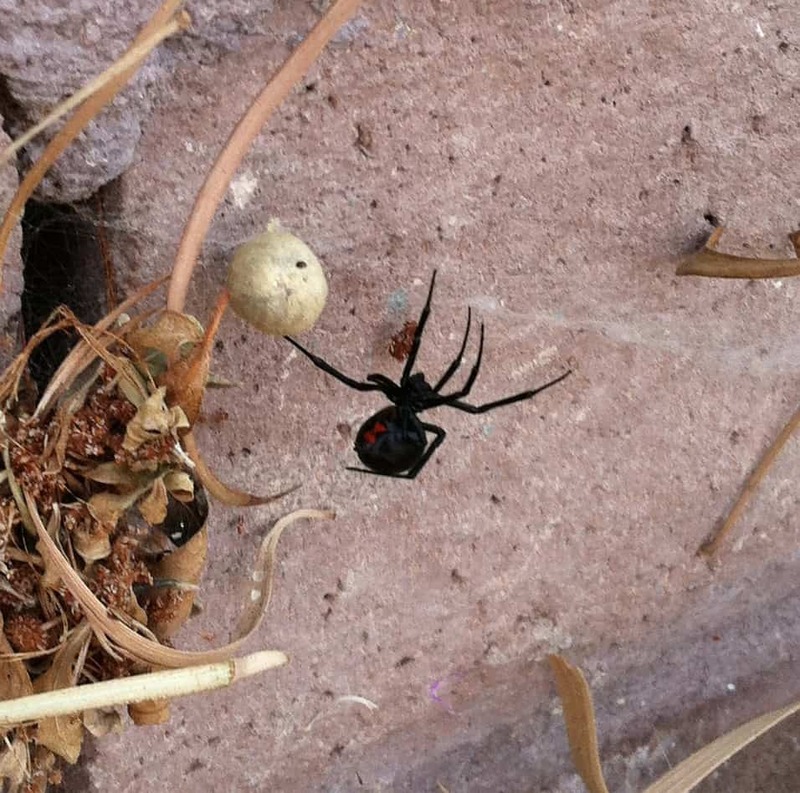 Prevent black widows in your home by reducing clutter so they have fewer hiding places, and by keeping your home free from other insects so spiders have fewer food sources. Brown Widow: This spider is found in Southern states like AL, AZ, AR, CA, CO, FL, GA, HI, LA, MS, NV, NM, OK, SC, TN, and TX. They prefer to live in undisturbed areas, such as underneath patio and indoor furniture, closets, attics, garages, and empty flower pots. They are brown as the name suggests, but brown widows are difficult to identify based on appearance alone. An easier way to recognize a brown widow is by its egg sac which is covered in small silk spikes. The venom of a brown widow is twice as potent as a black widow, although brown widows release less venom when they bite. Seek medical attention if bitten. Be wary of symptoms such as sweating, trouble breathing, muscle cramps and vomiting. Prevent brown widows in your home by tidying up and removing clutter to take away their hiding places, and by keeping your home free from other insects so they have fewer food sources. Red Legged Widow: This spider is extremely rare and only found in sand-pine scrub in central and south Florida. Red legged widows are small in size, with red legs as the name suggests. Like other widow spiders, its venom is poisonous to humans, although no bites have been recorded in medical history. 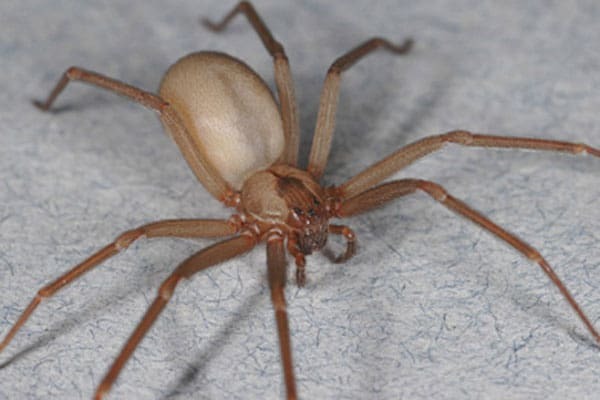 Brown Recluse: This spider is primarily found in the southern Midwest and Southeastern parts of the United States. As the name suggests, the brown recluse spider is brown in color and reclusive by nature. These spiders prefers to avoid humans and other creatures. A brown recluse will spend its time in secluded and undisturbed areas like quiet corners and neglected spaces. Although it is known for having a violin on its back, the best way to identify a brown recluse is by its eyes. Most spiders have eight eyes (two rows of four) but a brown recluse has six eyes (three sets of two). Of course, few people want to find themselves eye to eyes with a spider! Brown recluse venom is poisonous to people, and if you suspect you have been bitten by one, seek medical attention. Symptoms include a blister at the site of a bite, fever, and possible infection. Wolf Spider: This spider is found throughout the United States. Growing up to two inches in size, a fully grown wolf spider is brown or grey in color. Wolf spiders do not build webs or wait for prey. Instead, they hunt for their food. Wolf spiders usually live outdoors where prey is abundant, but when they find their way inside a home or building, they may choose to stay. They can be found under furniture and along floorboards indoors, or under leaf and woodpiles outdoors. There is some debate about the effects of a wolf spider bite since it is frequently misidentified, but they are venomous. Any spider bite can cause pain and may become infected; seek medical attention if swelling or fever persist. Preventing spiders in your home is a good way to avoid these dangerous spiders. Frequent cleaning to reduce clutter (the places spiders like to hide) as well as dusting to remove cobwebs is the first line of defense to get rid of spiders. While the spiders listed above can be dangerous, most spiders are beneficial pests that help control insect populations. Maintaining a pest free home will lower the odds of finding a spider in your house too. Knowing which spiders are dangerous, and which you don't need to be afraid of can definitely come in handy. Being able to identify a spider you see in your home, and how to remove it, could help save you and your family from painful spider bites that could lead to illness. Brown Widow: This spider is found in Southern states like AL, AZ, AR, CA, CO, FL, GA, HI, LA, MS, NV, NM, OK, SC, TN, and TX. 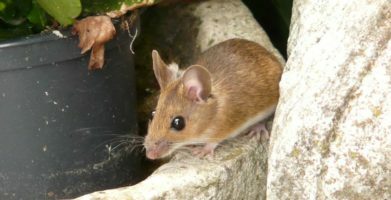 They prefer to live in undisturbed areas, such as underneath patio and indoor furniture, closets, attics, garages, and empty flower pots. They are brown as the name suggests, but brown widows are difficult to identify based on appearance alone. An easier way to recognize a brown widow is by its egg sac which is covered in small silk spikes. The venom of a brown widow is twice as potent as a black widow, although brown widows release less venom when they bite. Seek medical attention if bitten. Be wary of symptoms such as sweating, trouble breathing, muscle cramps and vomiting. Prevent brown widows in your home by tidying up and removing clutter to take away their hiding places, and by keeping your home free from other insects so they have fewer food sources. Wolf Spider: This spider is found throughout the United States. Growing up to two inches in size, a fully grown wolf spider is brown or grey in color. Wolf spiders do not build webs or wait for prey. Instead, they hunt for their food. Wolf spiders usually live outdoors where prey is abundant, but when they find their way inside a home or building, they may choose to stay. They can be found under furniture and along floorboards indoors, or under leaf and woodpiles outdoors. There is some debate about the effects of a wolf spider bite since it is frequently misidentified, but they are venomous. Any spider bite can cause pain and may become infected; seek medical attention if swelling or fever persist. string(55) "Dangerous Spiders - Which to Be Careful of in Your Home"